When I was younger I was defined by my success on the sports field. Since my faith was in my performance I was on a roller coaster of emotions. It was the same in my daily life. I strove for a life of moral perfection, but always fell short. Deep down I knew I would never be perfect. According to the Bible, all men are sinners in need of a Savior. God sent Jesus Christ to live the life we couldn’t and take the penalty we deserved. God has proven His gracious acceptance of me by raising Christ from the dead and allowing over 500 people to witness His life even after He was crucified. Jesus is my Lord and my righteousness. My faith is no longer in my performance, but in His life, death and resurrection on my behalf. Read Ephesians 2:8-9 and Galatians 2:20 to learn about my Savior and how you can know Him too! 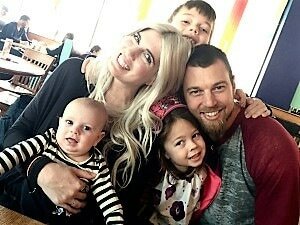 Ben Zobrist with his family.